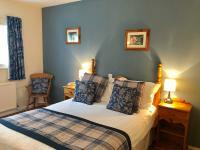 Our room was warm,comfortable and clean .Garden was immaculately maintained .All staff made ourselves and our collie dog very welcome.Enjoyed our three day stay whilst visiting family and local tourist sights. We stayed here for one night on our way to Cardiff and found a little gem. The welcome by Kelly was great and once we had taken our bags to our room we went to the bar for a much needed drink. Again we found everyone to be friendly and welcoming. The room in the stable block was clean, tidy and warm with the added bonus of being able to acces the terrace outside. Although the bathroom was very small it was adequate with good water pressure in the shower. Evening meal in the restaurant was good and tasty with prompt and friendly service as was breakfast the next day. Would definitely stay here again in the future if we were n the area. Great host and staff, good food and very comfortable rooms all at a reasonable price.We will be definitely staying here again. Our second visit here and we could not have chosen better. Once again we were given a great welcome from Kelly, Steve and all their wonderful staff who made our stay (3 days) something to remember. We can't fault the place and if you are a dog owner, look no further. Thank you Kelly, Steve and all the staff and we will be seeing you again soon. Very friendly staff and excellent food.Have the steak and kidney pie its special.An enjoyable stay. We got recommended to the Greyhound 2 years ago, and have stayed here a few times, it's a fantastic place to stay. Rooms are clean , food is top quality, and staff are very warm and welcoming, nothing is too much. Excellent stay. Lovely and warm and lots of doggy bits in the room. Very dog friendly.Great food in the evening and a lovely breakfast. 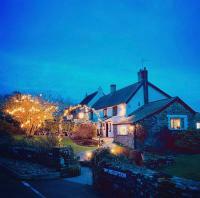 It may be 130 miles from where we live, but we just love the Greyhound Inn. Super staff, super food and super rooms all in a super setting. the Greyhound is my preferred choice when travelling on business to Cwmbran. Everyone is hugely welcoming, the food's great and Wifi works well both in the pub and accommodation. What's not to like? I found the Greyhound to be attractively laid out with open fires and cozy bars.The food was good and I stayed a night. The room was clean and the bed comfortable.I would stay again. We (and our dog) could not have found a better place to stay during our recent visit to Wales. Perfect for dog owners with everything provided, bed, bowls, towels and treats, not to mention great gardens to play in.You are immediately made welcome by all the friendly staff, the food, including breakfast, was excellent as was the accommodation. Wish we had you as a local!Thank you Kelly, Steve and all your great team for making our stay so comfortable and we hope to be back in May. besides the excellent food and selection of beverages, my stay was cosy and very relaxed. If I’m ever in the area again I will definitely go back. The staff where extremely inviting and helpful. We stayed for two nights at the Greyhound Inn, my husband and I, our daughter, who is studying at Cardiff Uni and our black labrador.We enjoyed a very pleasant stay here, our labrador didn't want to leave! She was very pampered and enjoyed joining us when we had breakfast because she had some sausage and the Stable bar was a cosy and very friendly (humans and other dogs) place with dog treats and a log burner! Wonderful walks right on the doorstep or you could drive on up into the heart of the Brecon Beacons within an hour and enjoy the lovely scenery on the way. Special diet requests were catered for, they have a book with categories for nut sufferers, gluten free, vegan and so on so you can eat without being nervous! Our double bed was very comfortable but, as my husband moves alot in his sleep, did bounce about a bit like a water bed so I had to spend the second night in the single bed (our daughter only stayed one night). We think we will book twin beds next time and push them together! The garden is open and the back of it has thick hedging but there is a busy A road just behind it so, unless you trust your dog not to wonder through, you should ask whether you can use the private fenced in garden or just keep them on a lead. Theshower water leaked onto the floor, just a small minor point as the water was very hot and showering was lovely! The room was very cosy and warm and the tv in just the right place to watch a good film. Kelly, the owner and her staff gave us 5 star treatment, nothing was too much trouble and they were very attentive and friendly. We will definitely be returning, our labrador will ensure that! Thank you to Kelly and the team! Hi Jane,Thank you so much for taking the time to post such a comprehensive review.We really do appreciate it and it was lovely to meet you all.Wishing your daughter the best in Uni and hope to see you again in the future. Always a great place to stay with a dog and now with an electric car. It was great to plug the car in and recharge it while we slept. Once again a fabulous New Year's EveFollowed by staying the night. Would thoroughly recommend. Looking forward to sampling the much talked aboutSunday roast in the near futuremany thanks to Kelly and all staff. Thank you all for a wonderful time at New Years Eve ! The food , service and band were all excellent as was the warmth of the welcome. Many thanks for such a memorable evening.happy 2019! We always look forward to a stay at The Greyhound. Friendly greeting on arrival before being taken to our lovely, cosy room. We have never been disappointed with any of the rooms we have stayed in with our dog. On this occasion we didn't stay for a meal as we were visiting family for a suprise party but our breakfast the following morning was just delicious and Ellie our little waitress was delightful. The gardens are very country cottage and are transformed into something magical by night. We are booked in for a few days over Christmas and we really are looking forward to it. Thankyou. We had a fabulous time over 2 nights, our room was very clean and well decorated.The breakfast is amongst the best I come across and is baking hot.Kelly and her team are beautiful people who do a great job. Perfect setting, friendly and helpful staff and superb food.Nothing else to be said. Nice sized and quiet room. Facilities good and food excellent. Would stay again. We stayed for one nigjt only and felt very welcome with our GSD. Both evening meals and breakfast were very good and the beer was well kept too.Despite the welsh weather we had a great time! Have enjoyed staying at 'The Greyhound ' many times in the past under the previous owner and was certainly not disappointed this time. Excellent evening meal. This has to be one of the most welcoming places I have stayed and beautiful on the eye too.The owner could not do enough to make our stay as comfortable as possible.I have very high standards and I often find faults, but this place was very clean and exceptional for its price point.Lots of nice little touches included, chocolates and nice biscuits in the room and fudge at checkout.The evening meal was of a very high standard, we had Cod and Chips.Oh and... when a venue polishes the copper on the urinals in the gents, you know they have an eye for detail. Very well run country inn/hotel. Good choice of food, warm welcome from owner and her staff, most attractive and well kept grounds. Lovely hotel in a stunning location. The staff were very welcoming and helpful and arranged a secure location for my bicycle. The food too was excellent. I stayed over on my way home from an interview. What a great little place, located in a beautiful area. Great room, nice food and really friendly staff and locals. Ill come back for a longer visit next year. We were concerned about the noise from the very nearby dual carriageway. We didn’t need to be. Secondary double glazing coped well.Staff very friendly. Our dinner and breakfast were good.The gardens lit at night time were very pretty. A good value for money stay and well situated. A very welcoming hotel, especially for our dogs. A great place to break a journey and it was good to hear about the future plans for the hotel. We thoroughly enjoyed a hearty beef casserole, although the choice of vegetables was far too limited for our taste. The breakfast was excellent, with homemade jams and delicious local yogurts, as well as a hearty 'full English'. Stayed for 1 night, we had a ground floor room with its own seating outside area which was lovely for relaxing, a bit of traffic noise but you soon got used to this and the water feature did help disguise the take your mind away from the traffic noise. Room was very comfy and we hadgreat nights sleep.Staff were very friendly and the pub food was great.Will definitely be staying here again as a good area to visit local tourist spots. We stayed at The Greyhound Inn ,for one ,the room was very comfortable and very welcoming after a long drive. We would recommend the evening meals, we found the menu very good catering for everyone's needs. The staff are very friendly and helpful. It was the most perfect stay for guests with dogs in a very hot summer - as the rooms lead directly into the beautiful gardens and terraces to sit and have dinner outside. It was bliss. The guests were lovely and friendly - great atmosphere, good food and efficient. The staff could not have been kinder and more helpful and welcoming. Will definitely come back. very friendly staff. Comfortable room opening directly onto the garden. Great for our dog, who particularly liked her treat . On arrival we were met with a very picturesque, country side Inn, in with well presented grounds. The accommodation was very clean and spacious and the evening meal was excellent. The staff were very welcoming and friendly. Overall an excellent stay. What a really lovely place to stay, wonderful host,Kelly, who was so thoughtful and kind. This is a now definite stop over when in area. Everything excellent. What a find , love everything about this place and wont hesitate to go again when we are next in the area. Good value,lovely people,good service and lovely and clean ,cant fault it . Lovely atmosphere. Great staff, friendly and with great advice on things to do. Comfortable and quiet. this was a very good experience and would recommend to anyone. Came to watch the rugby with my son. Lovely warm welcome from the owner Kelly even though we turned up early after travelling from Essex. The inn is a really interesting higgledypiggledy stone building. The staff were fabulouslyfriendly and helpful which made the trip so enjoyable. Food was top notch with a wide variety available in a warm n friendly environment . We were stuffed after our tasty dinner. Nice real ale on sale and a fair choice of other beers, wines n spirits. And, although the bathroom was smallish it was functional and the bedroom was comfortable. The Greyhound is positioned in lovely scenery with great looking gardens and a huge fountain. Bet it’s beautiful in the summer. Definitely will return. This stay was great value, accommodation was well equipped included toiletries, drinks making facilities and biscuits and chocolate in the room. Welcome on arrival was really friendly by Kelly the owner., there were roaring fires and a great selection of drinks and food. The Food was fantastic and great value, could only manage a main course so missed out on the desserts which again had a great selection to choose from. Excellent value for money, good food and nice rooms. Staff were all very welcoming and pleasant. Close to main road so traffic noise outside but fine in room. The setting is really nice and I would definitely stay again.Great for when travelling with a dog - places set aside for evening meal and breakfast with your dog and treats and fusses from the staff - close to nice dog walks too. Right from booking the rooms our experience was a helpful and pleasant one.The rooms are clean, well laid out with ample facilities and very comfy.It was a bit chilly (possibly me - I feel the cold) but a heater was supplied so this was not a problem.The food was excellent and plentiful, I couldn't finish my evening meal and breakfast service was quick and again the food delicious.I would love to stay here again and will definitely be back.The team here at The Greyhound have it just right, good food, good accommodation and good service!Well done. Thank you so much Helen for taking the time to post such a lovely review.We do really appreciate it and we are over the moon that you enjoyed your stay so much with us.Really hope to see you again.Take care and Best WishesKelly, Steve and the rest of the team. My husband and I have stayed at The Greyhound Inn on several occasions with our dog. Each room has always been very clean and charming with bowls, a towel and treats provided for our dog as well! The staff are always friendly and welcoming and always have time for a chat.The breakfast is amazing, offering a varied choice including a vegetarian and continental selection. We have also dined in the pub on an evening and have never been disappointed.The grounds are kept beautifully and at night the garden is quite magical. The new proprietors Kelly and Steve have made some nice little subtle changes to this established little gem in the Welsh countryside. We always look forward to our stay and would highly recommend a visit. Thank you so much for such a lovely review. We really appreciate itIt really was lovely to meet you all and we really hope that you do come back to see us.Take care and thank you again. Have been using The Greyhound for 25 years and, as always, the food was excellent.Room very comfortable (good nights sleep). Always enjoy staying here, whether business or pleasure. Have been staying here since 1992 and Nick has never failed to make the stays enjoyable, whether it be the food (wonderful) or drink (extremely drinkable) or the ambience (staff are always welcoming, and Robin is a delight). We stay here one night a week for work and bring our dog. From every aspect it is the most lovley place to stay. The staff are friendly and nothing is too much trouble. The food is wonderful and good value. The rooms are cosy, comfy and feel like a second home home. For its price range I could not recommend it more highly. If you want the Hilton or a boutique spa this hotel is not for you but but if you want clean, cosy place to stay with great pub food and a warm welcome for excellent value look no further . What an amazing place to stay! The room was spotlessly clean and very comfortable. The pub itself is so welcoming with great food and lovely staff. Without a doubt we'll be back to stay! Another beautiful stay at the greyhound. Looking forward to next time. I have been using the Greyhound Inn for over 20 years.The food and drink never fail to be amazing (the steak &Ale pie is always superb! ).The rooms are comfortable and, as a whole, the value for money is very good. A well appointed comfortable room, a friendly barman, a good breakfast and exceptional value for money. We had a lovely but short stay at this hotel.The Staff was very friendly and the breakfast was beautiful.Unfortunately we wish we could have longer to stay and enjoyed the dinning facilities and local area.We would also like to thank you for sending my Mother in Law fleece to us after left in the wardrobe. Very good accommodation and good food.Friendly and helpful. Stayed here as attending party in the area. Very friendly and helpful staff;spacious, pleasant room;excellent breakfast;plenty of parking. Highly recommended. We received a warm welcome as we have experienced several times before. Room was clean and comfortable although bathroom was cramped and dated.The food was very good indeed. Definitely a place to have on the list of 'good to visit'. Very nice stay and warm welcome.Food excellent and accomadation good. We had a great welcome from the ownerfor our stay. The food was excellent and served by very courteousand helpful staff.The bars and restaurant were well decorated for the festive seasonThe accommodation was very clean and comfortable..Would definitely recomend.Very good value for money. Yet another great stay at our favourite pub/restaurant. Looking forward to our next trip over there. We eat here quite often and we have never had a bad experience. The food is sourced with care and cooked and presented to a high standard. We decided to stay and relax this time and we did not regret it. The rooms are simple, spotless and exceptionally comfortable. The owner and staff are friendly and efficient and welcomed our wee dog to stay and accompany us while eating. First class and attentive service .Excellent breakfast - including the entertainment provided by Robin ! Evening meals also very good and portions generous - too much for us ! Overall a very enjoyable break which was very good value for money and Alfie was blissfully unaware of any fireworks ! Cannot fault the greyhound inn. Food was excellent, staff really friendly, location beautiful and 100% all round satisfied!! My partner and I are already planning our next jaunt there!! Many, many thanks and looking forward to staying at the greyhound again.